Consider the popcorn: A simple snack, spare in its ingredients and preparation; a low-fat alternative to the candy bars, donuts and ice creams of the world; an ancient snack, developed by Native Americans and passed down to the modern consumer; a magic food that grows before your eyes — popping at first slowly, then maniacally, before petering out to signal its buttery completion. But one Spokane Valley man, Larry Newkirk, says this seemingly benign treat almost killed him. His snacking on multiple bags a day, he says, left him extremely sick and short of breath, his lungs deteriorated by bronchiolitis obliterans, a potentially fatal lung disease. His doctor believes diacetyl, a compound used to increase stability in the butter flavoring used for years in many brands of popcorn, is the culprit causing his disease, which is incurable except by lung transplant. And now, after years of confusion concerning the reason for his worsening health, Newkirk has filed suit against a slew of companies, including ConAgra Foods, the popcorn makers; ShopKo Stores, where he bought the snacks; and manufacturers of the chemical diacetyl. Though Newkirk’s story is unique to the Inland Northwest, it is not new to experts in the field of occupational medicine, workers at popcorn plants, a Seattle journalist or a U.S. senator from Washington. Unfortunately for Newkirk, the small cadre of people who knew about his disease is just that — small. It’s no wonder that people familiar with the disease are hard to find. “Most doctors are generally not familiar with the disease,” says McClain. But there’s no doubt: The danger is there. When popped, microwave popcorn that contains diacetyl releases a toxic vapor linked to Newkirk’s obstructive lung disease, a fact recognized by the U.S Environmental Protection Agency and the Occupational Safety and Health Administration. Diacetyl is in a class of chemicals called ketones. “Commonly recognized ketones are paint strippers,” says McClain. Ketones are added to paint and perfumes to increase stabilization, giving them a longer shelf life. For the same reason, and because of its buttery flavor and aroma, diacetyl is added to dairy products. “Diacetyl is added to all but salted butter throughout the industry,” Mark Wustenberg told Seattle P-I reporter Andrew Schneider. Wustenberg works for the Oregon-based Tillamook Creamery. “If you don’t salt it, you have to add something to keep it from spoiling, and lactic acid and diacetyl is a way of stabilizing it.” The chemical occurs naturally in beer and wine, and in the liquid or solid form, has so far not been found to be harmful. 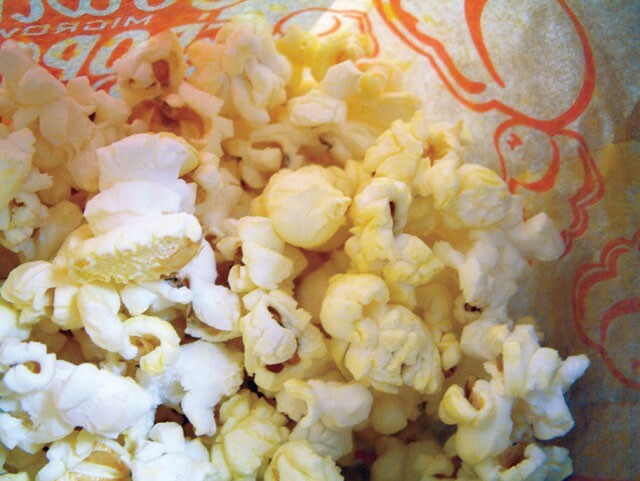 About 10 years ago, the disease picked up a second name — popcorn lung — after it was diagnosed in dozens of Midwestern popcorn factory workers by Dr. Allen Parmet, a renowned expert in occupational medicine and the same man to diagnose Newkirk. Following Parmet’s diagnoses, the National Institute for Occupational Safety and Health collected air samples from factories in many Midwestern states. Their investigations were soon linked with others taking place in California, where workers in contact with diacetyl contracted the disease. Though Newkirk is the second American consumer to contract the disease, many popcorn workers have already filed suit and won against manufacturers of diacetyl. In 2004, Eric Peoples was the first to receive a monetary award for damage to his lungs caused by his years working in a popcorn factory, a Gilster-Mary Lee plant in Jasper, Missouri. Jurors there awarded Peoples and his wife $20 million in a verdict against International Flavors and Fragrances Inc. and its subsidiary, Bush Boake Allen Inc., manufacturers of diacetyl that are expected to be named in Newkirk’s suit. In September 2007, Washington Sen. Patty Murray joined Sen. Edward Kennedy in sending letters to the Centers for Disease Control, the Food and Drug Administration and the Department of Labor calling for more regulations on the chemical. A few weeks after their letters were sent, the U.S. House of Representatives passed the Popcorn Workers Lung Disease Prevention Act. The Senate took no action on the bill. Then late last year, Schneider, recognized as one of the nation’s leading journalists on the subject, published the results of a test the P-I conducted showing that restaurant kitchen workers, as well as the regular homemaker, could be in danger due to diacetyl’s ubiquity in cooking oils and sprays. Then in September 2008, two more U.S. senators — Missouri’s Claire McCaskill and Ohio’s Sherrod Brown — joined Murray and Kennedy.